Major League Baseball asked yesterday to meet with Rick Ankiel and Troy Glaus after the pair were accused of receiving performance-enhancing drugs from a Florida pharmacy under investigation for illegally distributing prescription medications. Ankiel, the pitcher-turned-outfielder who has hit nine homers since rejoining the St. Louis Cardinals last month - including two while driving in seven runs Thursday - received eight shipments of human growth hormone from January to December 2004, New York's Daily News reported yesterday. Glaus, a four-time All-Star now with the Toronto Blue Jays, received multiple shipments of nandrolone and testosterone between September 2003 and May 2004, SI.com reported. "We're going to look into both sets of allegations," said Rob Manfred, baseball's executive vice president of labor relations. Manfred would not go into details, but MLB already had requested meetings with the two players, a person familiar with the request said, speaking on condition of anonymity because no announcement was made. Before last night's game in Phoenix, Ankiel said any drugs he received in 2004 were prescribed by a licensed physician to help him recover from reconstructive elbow surgery. Ankiel initially acknowledged human growth hormone was among those medications, then refused to list his various prescriptions. "I'm not going to go into the list of what my doctors have prescribed for me," he said. "I've been through a lot emotionally and physically. There are doctor and patient privileges, and I hope you guys respect those privileges." After talking to Ankiel, general manager Walt Jocketty said he was satisfied that nothing improper had oc curred. "Everything was legal," he said. "There was no violation of major league rules. There was no violation of any laws. At this point, if there's anything more to decide, Major League Baseball will look at it and let us know." Ankiel said he would cooperate with any investigation. "I'll be happy to help and conduct anything that Major League Baseball wants to talk about it," he said. Ankiel is a former Cardinals pitching phenom whose career seemingly reached a dead end when he experienced an inexplicable run of wildness in 2004. 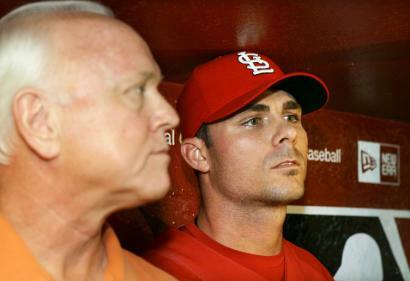 Authorities have not accused Ankiel of wrongdoing, the Daily News said. According to the Signature Pharmacy records the News cited, he stopped receiving HGH just before baseball banned it in 2005. Glaus, in St. Petersburg, Fla., for Toronto's game at Tampa Bay, did not stop when reporters tried to speak with him before batting practice. Ankiel and Glaus both have had careers interrupted by injuries. Ankiel overcame elbow and knee injuries and made it back to the majors last month for the first time in three years. Glaus led the American League with 47 homers in 2000 and was MVP of the 2002 World Series for the Anaheim Angels, then missed large stretches in 2003 and '04 because of shoulder problems. Citing records the newspaper obtained, the Daily News said Ankiel got HGH shipments that included Saizen and Genotropin, two injectable drugs. Florida physician William Gogan signed Ankiel's prescriptions, providing them through a Palm Beach Gardens clinic called The Health and Rejuvenation Center (THARC), the newspaper reported. Ankiel said he was aware of the clinic but not Signature Pharmacy. "I don't know anything about the pharmacy," Ankiel said, "and I don't know anyone there. I've never purchased or ordered anything from that pharmacy." The drugs were shipped to Ankiel at the clinic's address, the paper said. The 28-year-old Ankiel lives close by in Jupiter. Glaus received shipments at a Corona, Calif., address that traces to the player, SI.com said., citing a source in Florida with knowledge of a Signature Pharmacy client list. SI.com said its information dealt only with receipt of steroids and not use. Prescriptions written in Glaus's name were obtained through New Hope Health Center, a California-based clinic, and were sent through Signature, SI.com said. The prescribing physician was Ramon Scruggs, currently on probation and prohibited from prescribing drugs over the Internet, SI.com said. "The accusations made today in the media . . . are simply accusations," Blue Jays president Paul Godfrey said. "I am in no position to make comment on information that is attributed to an unnamed source." Signature is at the center of an investigation by the Albany County (N.Y.) district attorney's office. The probe recently led to the NFL suspensions of Patriots safety Rodney Harrison and Dallas Cowboys quarterbacks coach Wade Wilson. Steroids investigator George Mitchell sent letters to major leaguers asking them to contact him with anything they might know about the use of performance-enhancing drugs. Both the San Francisco Giants and Los Angeles Dodgers received the letters yesterday. The memos were handed out by the clubs, and other teams apparently also got the same letter. "It's encouraging any player that if you have any information about steroids, feel free to contact Senator Mitchell," said Giants player representative Randy Winn. Players also received a note from the union alerting them that Mitchell's letter was coming and to be careful what they said publicly on the topic. Some players on the Dodgers and Giants ignored the letter, throwing it in the trash. Said the Dodgers' Nomar Garciaparra, "They're wasting paper." Cincinnati Reds catcher Ryan Jorgenson was suspended for 50 games, the third player penalized this year under Major League Baseball's drug program. The announcement from the commissioner's office did not cite a failed drug test, making it unclear why he was being suspended. Jorgenson, a 28-year-old originally signed by the Chicago Cubs in 2000, played four games for the Reds this season . . . Houston Astros minor league pitcher Carlos Lazu, 21, was suspended for 50 games following a positive test for a performance-enhancing substance under the minor league drug program.